Inverness eased into the last sixteen of the Scottish Cup after removing Lowland League side East Kilbride from the competition. The opening half hour ended the tie as a contest as goals from Jordan White, Aaron Doran and Liam Polworth put the hosts three up before the break. Craig Reid unfortunately turned a cross into his own net to end the scoring midway through the second half. Suspended duo Shaun Rooney and Brad Mckay returned to the starting XI, as did George Oakley who partnered Jordan White up top in a 4-4-2. Tom Walsh is out with a broken foot and Coll Donaldson has had groin surgery, Jamie McCart deputised in central defence. East Kilbride had a couple of familiar faces, David Proctor and Chris Humphrey both started for Kilby. It was a brisk afternoon as just under 1200 welcomed the teams onto the park with the 16th minute on the minds of many. Inverness wanted to get off to a flier and they did just that. Shaun Rooney had already tested keeper McGinley and a minute later Jordan White was on hand to open the scoring when the ball found him in the box and he slotted home. That warmed the palms of the fans but in the sixteenth minute the palms were roasting when a tribute for Dawn Sinclair filled the stadium with applause. Lovely tribute from everyone in the stadium for the youngster who sadly passed away recently. That lifted the players once more and in the 21st minute Aaron Doran tidily dispatched the ball behind the keeper as he guided a low shot from beyond the edge of the box into the bottom corner. The hosts were in full flow with White and Polly going close and it was no surprise that a third goal was added when Liam Polworth finished with aplomb, firing high into the net from ten yards in the 27th minute. McGinley made a fantastic save to deny a lively George Oakley, the keeper flying high across his goal to keep out a roaster from George who had turned his marker brilliantly before unleashing a shot from around twenty yards. Former Motherwell winger Chris Humphrey tested Mark Ridgers with a high strike, but the keeper was able to palm it away. That was East Kilbride's best moment of the half. Ex-Inverness player David Proctor had to retire five minutes after the break and was given a warm reception as he left the field to be replaced by Scott Stevenson. Inverness passed up on a great opportunity as Brad Mckay, in his 100th game for the Caley Jags, skied one from close range when he should have scored. The urgency had gone from the Caley Jags and East Kilbride enjoyed their fair share of the ball without really troubling Ridgers. With twenty minutes left Craig Reid diverted a harmless cross into the net to make it 4-0 with McGinley stranded, the cross looking to be heading nowhere until Reid stuck a leg out. There would be no further scoring and only Nathan Austin will be able to explain why he delayed long enough to allow McGinley to block his point-blank effort when he should have bulged the net. 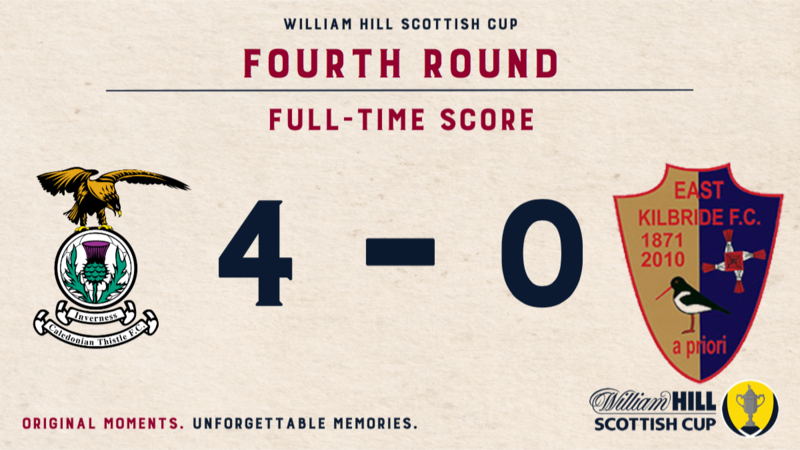 It mattered not as the game played out and ended with Inverness going into the pot for the last sixteen. It was a comfortable afternoon for Inverness but East Kilbride can be heartened by their second half display where Inverness were unable to punish them with any authority although a couple of howlers could have added some polish to the result. Inverness Caledonian Thistle manager John Robertson said: "It was comfortable but we made it comfortable by a very, very fast start. "I'd like a winnable home tie. We want to progress. We've got a proud record in this competition and just four years ago we won it." His counterpart, East Kilbride manager Stuart Malcolm said: "It's a huge step up for us going from the Lowland League to play against Inverness. We didn't start overly well and they put us to the sword. "The second half was much better. We had a couple of half chances. Inverness were excellent. They are entirely professional and did a good job." We're looking to start strongly against East Kilbride in the Scottish Cup. 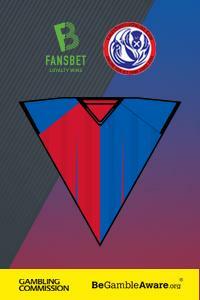 Our partners @Fans_bet have boosted odds of 4/1 on ICT to be leading after 10 minutes. 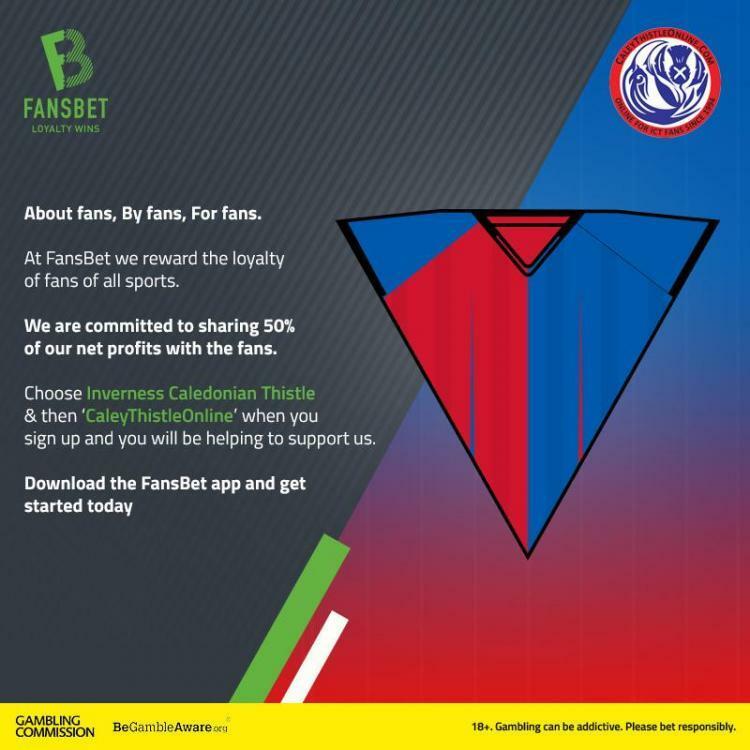 Sign up here http://bit.ly/2OBvlLv & select Caley Thistle Online to help us support the forum and ICT fan causes﻿. 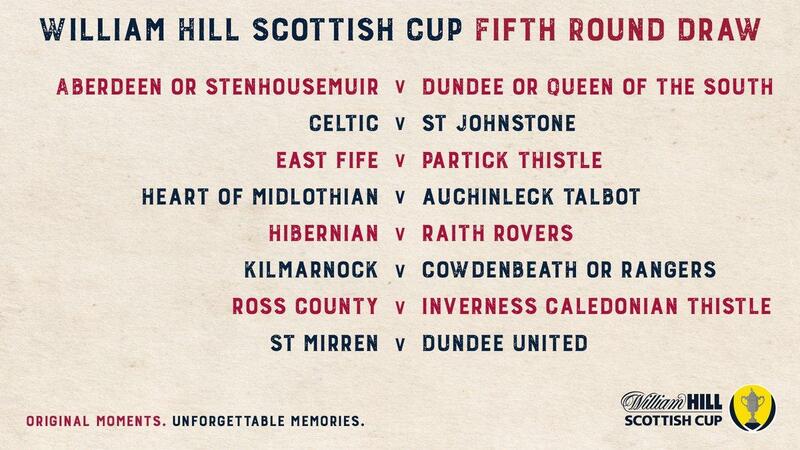 And would you believe it, another Highland derby in the Scottish Cup. Subs (not used): Kean; Craig, Longworth, Winter.